Home > Articles > Do We Need Libraries? Do We Really Need Libraries Anymore? Back in my school days I was a regular visitor to the library, but when was the last time I visited a library to borrow a book? It must be over two decades ago, so clearly I don’t value libraries. But I do, I think, just somehow they have slipped me by. Most of us have access to knowledge through our smart phones, so why traipse into the city centre to access info in a public space? Perhaps it is a mix of feelings of community and connectivity, plus certain information being available in a library that cannot be found online. My local library, when I lived in the UK, tried to renew itself by expanding into a new architect-designed building with lots of computers alongside the normal book shelves. Compared to the older smaller library it was constantly noisy, a mix of open-plan, larger space and computers drawing in teenagers. The previous library was mostly populated by the very young and the very old. Teenagers are often criticised by adults when they gather, but like any group they need suitable spaces; the library should have made an enclosed space specifically designed for them. Library design should appropriately accommodate a wider range of users and their disparate needs. My favourite libraries are dusty old buildings with the smell of wooden shelves and leather volumes. Some college libraries in Cambridge and Oxford spring to mind, such as Fellows Library, Jesus College, Oxford. 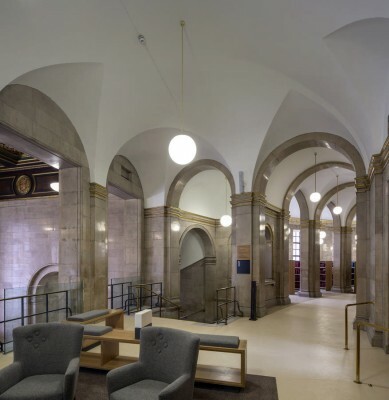 As a student in Manchester I found the dull university library unpleasant so rarely studied there, whereas in London a visit to the British Library Reading Room (just before it got redeveloped) was a joy, a huge circular space that was mesmerising in its scale. 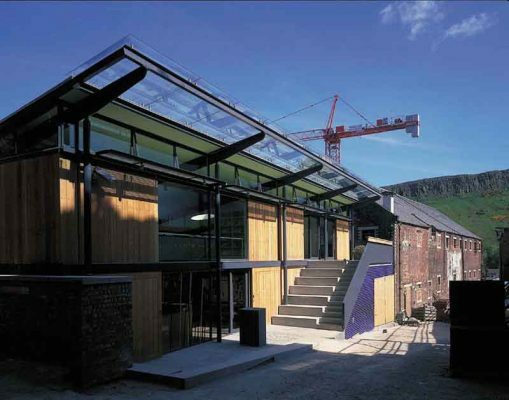 An interesting library that I have taken many architectural visitors to is the Scottish Poetry Library by Malcolm Fraser Architects. Malcolm described the space, with circular rooflights, as being a glade within a forest where you could nestle and devour a book. The description was more delicious than the reality (as is often the case with architects’ marketing) but nevertheless it is a pleasant place to linger, and also had steps outside for public open-air readings. Malcolm didn’t reinvent the library typology, he made a humble well-loved building that tried to focus on reading rather than simply forming a repository of books. 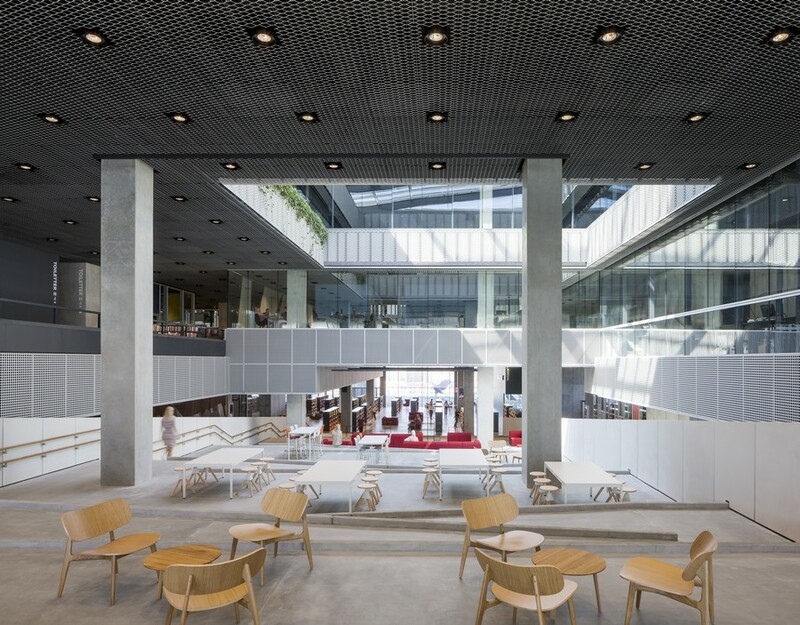 My pick of recent library buildings completed by respected architects include Musashino Art University Museum & Library, Tokyo by Sou Fujimoto Architects. This has a warm wooden interior and uses steps as a place to linger, a popular device especially in recent decades, to interrupt the flow of a space in order to create a restful gathering place but without using furniture. 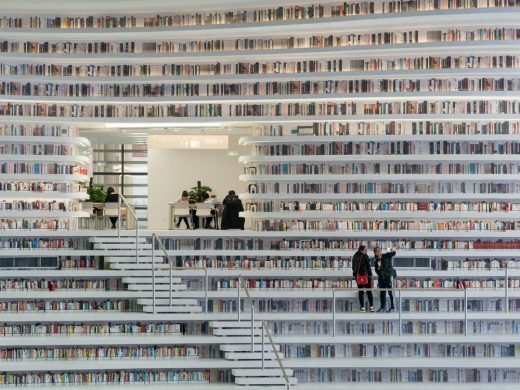 Some cities have built large new ‘library’ buildings that reinvent the typology almost as a civic centre, for example the National Library of Sejong City in Korea, and Dokk1 in Aarhus, titled ‘Urban Mediaspace’. The title indicates this is less a place for cosying up and reading a novel and more a place to interact publicly with technology. I feel some libraries these days are trying to straddle too many functions, often making the spaces unpleasant places to be if you want to research and borrow a book. In many cases libraries have turned into parent-toddler meeting places, or after-school hang-outs. A controlled quiet space is a must, and if space allows, further cellular divisions assist. When Foster + Partners’ Cambridge Faculty of Law Library opened the students revolted due to noise levels in the three-storey terraced open-plan space. Open-plan spaces look great but rarely allow sufficient space for quiet contemplation. 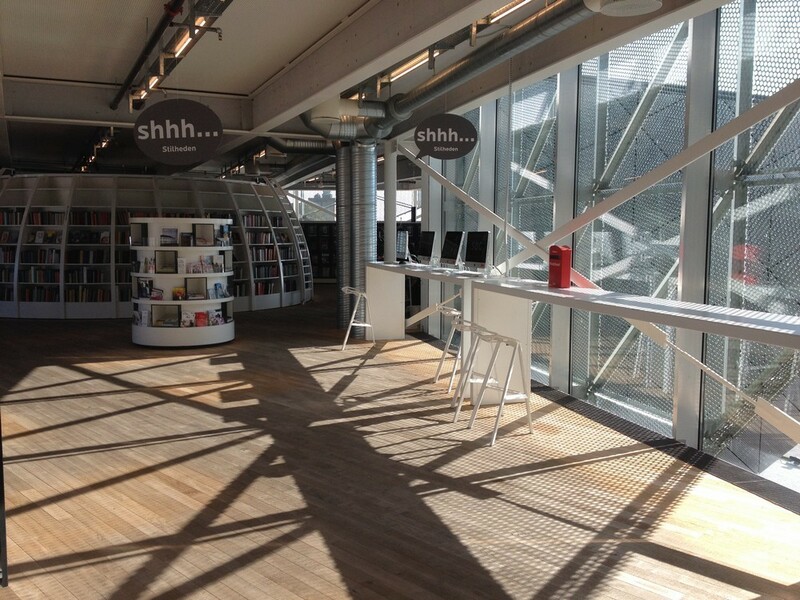 I recently visited The Culture Yard in Elsinore, Denmark, by AART architects, a library and cultural centre. Despite over 750,000 visitors a year you can still sit in a comfy chair looking out over the sea and read a newspaper or book in peace: this is thanks to designated areas for quiet and less quiet activities. A smaller local library, also in Denmark, is open 24/7 – after usual business hours you enter by swiping your library card. This building has a big space with children’s books, hammocks, comfy chairs etc. The adults section is of equal size and offers window seats, and a trolley with good-will coffee and tea, besides all the usual bookcases. This set-up invites all users to both respect the building and other people. 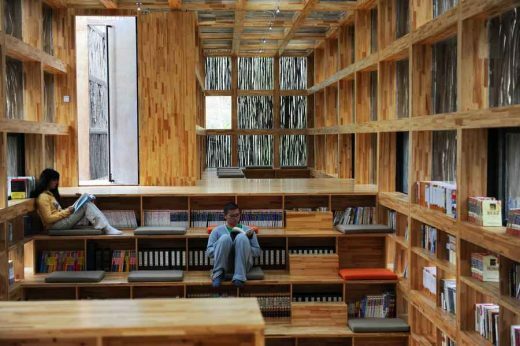 Possibly my favourite library interior is LiYuan Library, near Beijing, by Li Xiadong／Atelier. Like the Tokyo library by Sou Fujimoto it has a lovely wooden interior, except here the feel is much more rustic. The novel metaphor used is for the exterior are the locally-sourced wooden sticks gathered by villagers to fuel their cooking stoves. However it is the playfully stepped landscape that most interests me, if I had a local library like this I would definitely visit. 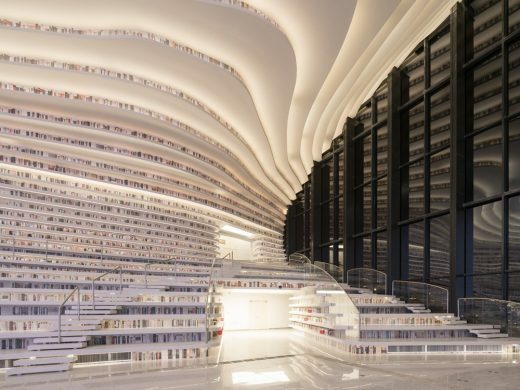 Probably the most interesting library design for me of late is the Tianjin Binhai Library Building in China by innovative Dutch architects MVRDV. The library is mostly formed in one huge space, centred on a glowing white globe. The library shelves flow rhythmically around this space like a stepped terrain of paddy fields (perhaps that was a metaphor the architects intended?). 1.2 million books cascade from the stepped ceiling and down the walls. The result is fresh and fun, but a long way from the quiet space of the Jesus College, Oxford, which is ultimately the kind of library I prefer….if I were to use one. Libraries are a treasured cultural institution that foster community engagement, they should be supported. We need them, and they are evolving in different ways across the world, but many need to work harder at successfully accommodating disparate needs.